Most of the people think that if they are buying a mountain bike that costs less than a thousand dollars or let’s say 500 bucks, it’s either a cheaply built mountain bike or just an imposter of a ‘real’ mountain bike that only resembles in terms of looks. But is that the case so? Though there are many brands out there that do feature some of the worst and cheap quality materials when it comes to cutting down the prices, even some of the biggest brands opt for these type of tactics to fool some of the newer riders into thinking that they are getting the same quality of mountain bike with a few small changes here and there, to make them cheaper. But it turns out that they are now guilty of slapping their own widely-respected name in the industry. However, that’s not the case with all the brands out there in the market. If you do some research and some digging you can easily find some of the best entry-level mountain bikes that are affordable and offer you some of the best quality components for the price that you are paying. With that said at the end of this endeavor of yours to buy a good entry level mountain bike, you would be able to choose a mountain bike for yourself which will suit your riding style, budget, and all that matters. So without any due let’s begin. After that, there’s a guide on how to choose the best mountain bike for yourself. This is sure to make things easier for you to find the perfect bike that will be suitable for you, your riding style and where you’ll be riding your bike. As we move down the list, we’ll be seeing some of the best entry-level mountain bikes that you can get for under $1000. These bikes offer some of the best features that you can only find in higher end MTBs. Here’s a list of the best mountain bikes that you can get for under $1000. Many of you must have heard a thousand times that in order to buy a good carbon fiber mountain bike you need a budget of somewhere from $3000 to $5000. But is that true? First, when these carbon fiber bikes came in the market, it was merely a dream to buy one. But over the years with the advancement in technology; it became more accessible for manufacturers to build carbon frames that are affordable yet maintaining the same quality standards of a high-end premium carbon bike. That being said, for you, I have BEIOU Toray T700 Mountain Bike, which is built entirely from carbon fiber and features some of the best quality components that further compliment it. So if you are an avid cross country rider, then this is the best carbon mountain bike that you can get under $1000. 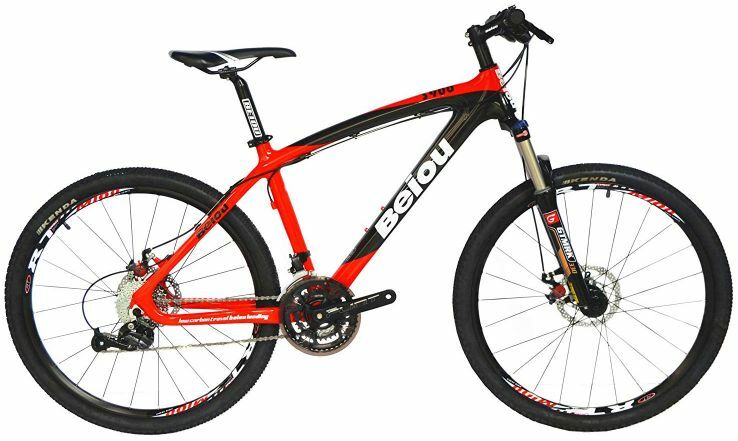 BEIOU Toray T700 is a solid mountain bike with a carbon frame which is of the same quality that you would find in any of the high-end mountain bikes. Though BEIOU doesn’t stop there and also features carbon handlebar and seat post which helps maintain the bike’s weight, down to a minimal level. Overall, I was surprised to see how noticeably light and smooth the bike was. Its lightweight yet works efficiently and effectively providing your bike greater speed and endurance level. 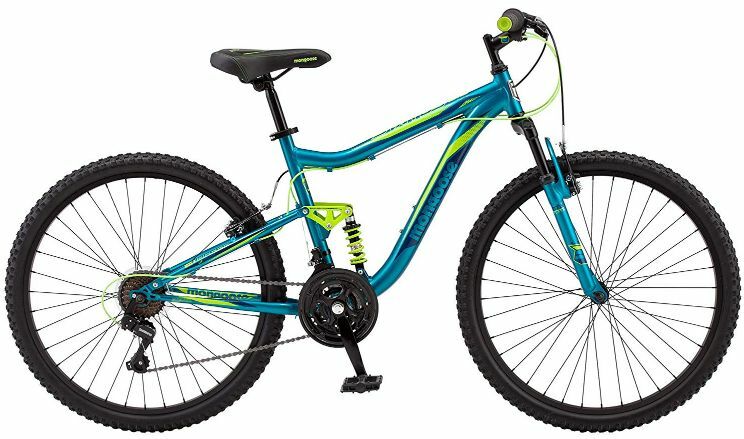 If you are looking for a mountain bike with 29-inch wheels, then Diamondback Overdrive is the bike to look for. The thing about these 29ers is that they allow riders to move over obstacles much easier and help you fly through your course by achieving higher top speeds. However, you just can’t fit 29-inch wheels in any frame you like; you need a frame that is specifically built for 29er. This leads many of us towards upgrading our bikes, and that’s how Diamondback comes into the rescue with Overdrive. The Overdrive 29 checks off all the boxes with a hand-built 6061-T6 aluminum alloy frame which keeps the weight to a minimal level, giving the rider leverage and control of riding a 29er. It’s not all about the 29er wheels and lightweight frame that gives all the thrill to the rider. Overdrive’s aggressive design and riding position are what makes it ideal for riding on swoopy single track trails and cruising to the top of a climb. DB Laser Series handlebars that are 720mm Wide / 15mm Rise with 31.8mm DB 3D Forged stem. The value what Diamondback Bicycles are offering with Overdrive is just insane and for just under $1000 its one of the best and one of my top recommendation for anyone looking into entering the 29er mountain biking world. Trust me you wouldn’t get a better deal than this one with 29-inch wheels. Some companies are charging 2X to 3X more than the actual price, for the same set of components and features. 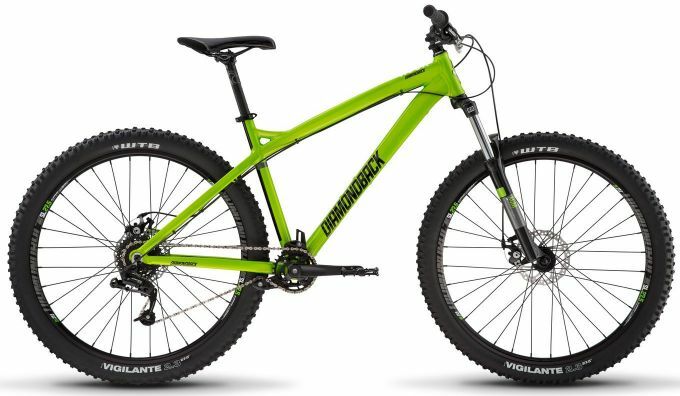 The other bike on our list is also from the Diamondback Bicycles, and this one comes in with the industry standard 27.5-inch wheels, that are meant to be ideal for mountain biking. These long and low hardtails might just be the most fun bikes to ride. Diamondback Hook features also features a hand built 6061-T6 aluminum alloy frame with a modern progressive geometry meaning you can ride this on any trail and have a blast. The bikes that follow this modern progressive geometry are longer in the front and shorter at the back, making them have a low center of gravity hence, increasing the maneuverability and with those 27.5-inch wheels it makes the Hook deft and precise for any type of trail. To keep your shifting fast and simple, the Hook keeps things simple with an SRAM 1×8 drivetrain. 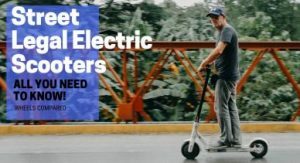 It gives you a good gearing range for zipping through any terrain, and there’s also a chain guide to guarantee more pedaling and less stopping. The 27.5 x 2.3 inches tires dish out plenty of traction even when it gets loose on the trail, and they sit on durable double wall rims. For rough trails, the bike features a 120mm Suntour front suspension fork to eat up the bumps. Also, you get a nice wide handlebar that gives you lots of leverage for steering through twisty trails and mechanical disc brakes to keep you in control on the steeps. The brakes have lots of power and are really simple to use. Overall it’s a really good entry-level mountain bike. It’s also good for beginners who are looking for getting into mountain biking world. 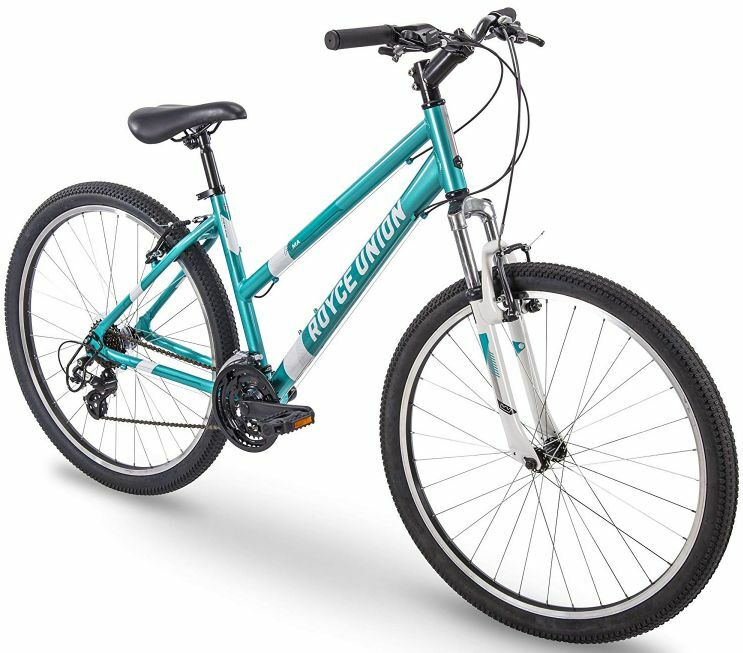 Best off all you can get one of these for around $700 to $800 and Diamondback ships 85% partially assembled bikes that need just four easy assembly steps, to get you on the trail right away. 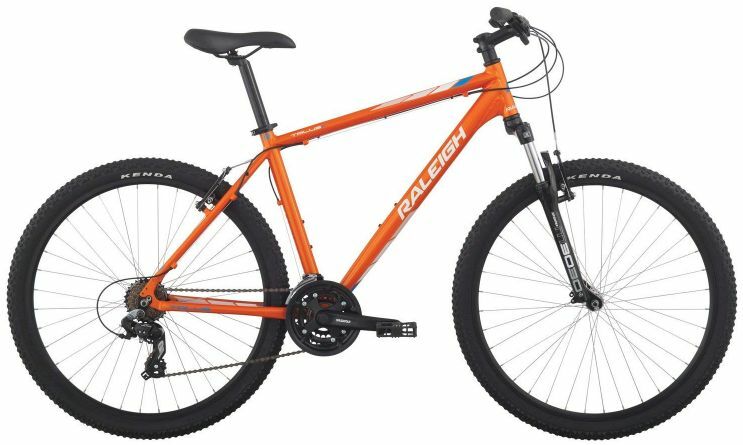 Similar to the Diamondback’s Hook we have Raleigh Bikes Tokul 2 which features the same kind of modern aggressive geometry and is good for entry-level mountain bikers. But what sets apart Tokul 2 from the Hook is the drivetrain and hydraulic disc brakes. Other than that, both the bikes offer the same kind of features and are the best in their class when it comes to budget mountain bikes. If you’ll ask for my personal preference I would choose the Tokul 2 over the hook because it offers a wider set of gears to choose from, 1×9 speed Shimano Altus drivetrain and on the other side you are getting 1×8 speed SRAM drivetrain. Although it’s not that big of a difference that would turn off you from buying the Hook but when it comes to comparison, then these tiny details definitely count. Along with this, what I really like about the Tokul 2 is that it features a hydraulic disc brake which gives you greater leverage and precise stopping power which might be needed in critical situations. 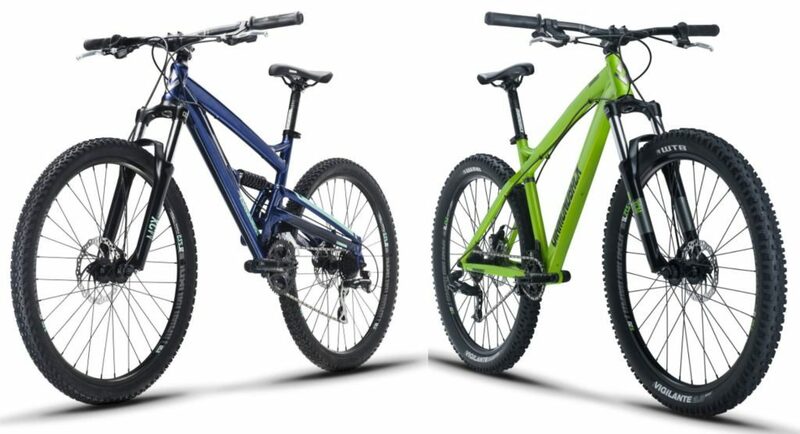 At the end of the day, if you have to choose from the Hook or the Tokul 2, I would advise you to go for any of the two because when you are getting into mountain biking or you are beginner looking for an entry-level bike you don’t have to go into complications and tiny details. All that matters is that you love and enjoy every last bit of your ride. As we all know full suspension bikes are a bit expensive than the hardtails, as they are more versatile and offer greater shock absorption with that added rear shock. Full suspension bikes have their pros and cons that I would cover later in the buyer’s guide but riding one doesn’t have to break the bank. With that said if you are looking for the best full suspension mountain bike under $1000 then Diamondback Atroz 1 is the bike to look for. It’s just insane how much value it puts on the table for the money you are paying. While Riding Atroz 1 you’ll be zipping down rough trails that will feel buttery smooth. Just like the Diamondback 29er it’s also built from the same kind of aluminum frame and comes in with 24-speed drivetrain (three up front and eight gears at the back) that gives you a wide gear range. Grinding up a steep climb or flying on the flats you’ll always find the right gear to choose from. In addition, the bike also features grippy mountain bike tires that are just what’s needed for the trails. Plus the lugs are perfectly spaced to give you an efficient ride which helps in getting to your destination even faster. Rowdy trails go great with a full suspension bike, that’s why Atroz 1 features front fork suspension to soak up bumps and a single pivot rear suspension which is reliable and low maintenance. When paired together these sets of suspensions will hold your line exceptionally on the trail of your choice. Along with this, the bike also features mechanical disc brakes that are strong and reliable, perfect when things get steep and scary. For greater leverage and precise steering, the bike also comes in with wide handlebars and DB “Shortie” stem. What’s good about the Atroz is that it won’t put you into the complications of riding a dual suspension bike as the brake levers and shifters are all right at you fingertips for quick and easy use. So, overall it’s a really good entry-level full suspension mountain bike and most importantly it won’t break your bank. Now as we move down the list, we’ll be seeing more affordable mountain bikes that are cheaper and offer some really good value on the table which you won’t find anywhere else for such a decent price. 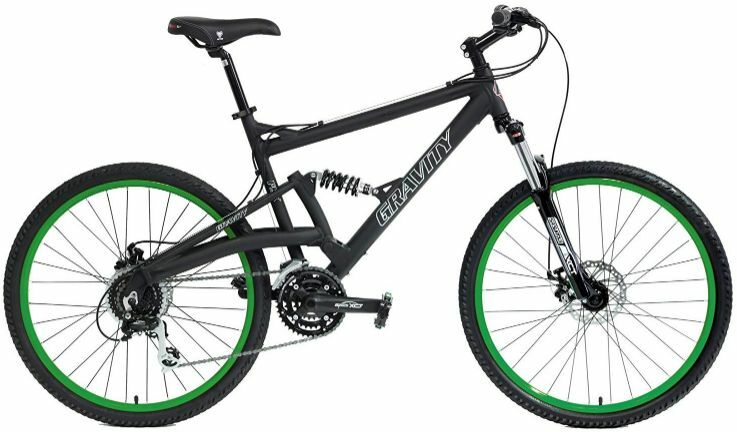 If someone asks me what’s the best entry-level mountain bike or what’s the best mountain bike under $500? So without any hesitation or setback, my answer to them will be Merax Finiss. Seriously, the value this bike puts on the table for the money is just INSANE. You can get one of these for just around $250; I still can’t figure it out how Merax manages to keep those prices down while maintains the high industry standards. Again it’s INSANE! At the same time, some companies are offering the same kind of features for a price that is 2X to 3X the price at which Merax Finiss is listed. That’s the reason why it wins the #1 Spot in our list under the $500 mountain bikes section. It has not only made to our list, but it’s also one of the very few mountain bikes that are featured on Amazon’s Choice. The bike features an aluminum frame which is meant to take on singletrack trails with a front suspension fork that is sure to soak up all the bumps. What’s good about this frame is that the aluminum is heat treated which makes it lightweight. So it’s not like most of the cheap mountain bike frames that feel clunky and heavy. Kenda 26-inch tires to offer you plenty of traction on rough tracks and trails, including rocky terrains. So, overall it’s really a solid bike and without any doubt, and the best hardtail mountain bike that you can get for around $250. 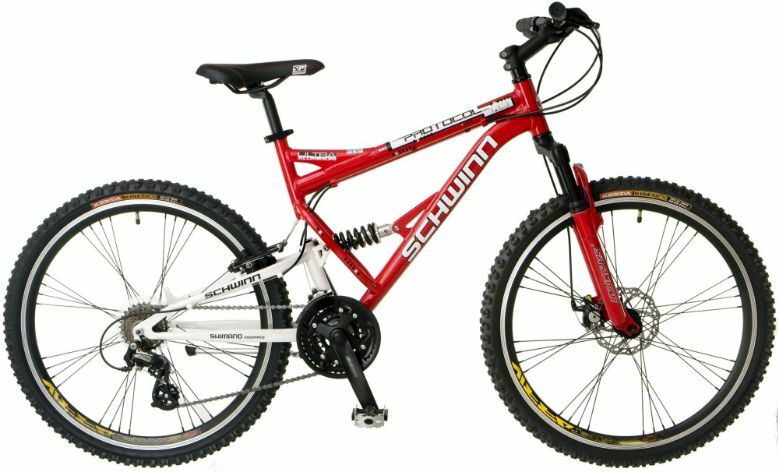 The second bike that’s worth mentioning is the Schwinn’s Protocol 1.0 which is a full suspension bike. The protocol is specifically built to take on tracks and trails where you need those dual suspensions to kick in giving you more thrill. The bike features an aluminum frame which is light. This bike can really withstand harsh treatment on rough terrains and dirt paths. 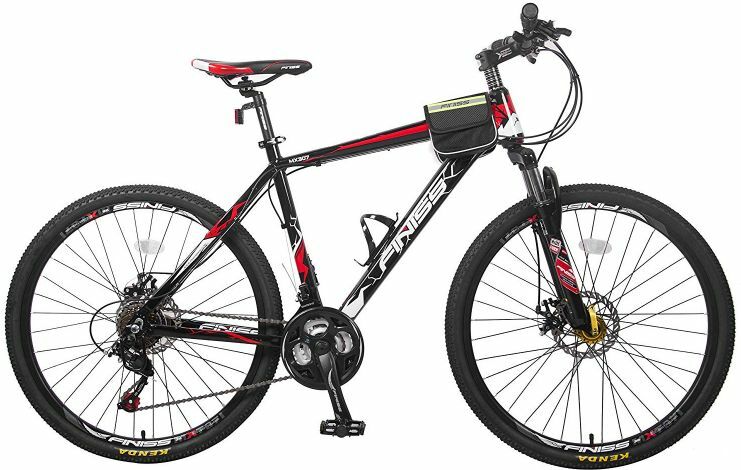 It comes in with 24-speed Shimano Easy Fire trigger shifters and Shimano Altus rear derailleurs that provide smooth and precise shifting as you climb even the steepest hills. Protocol 1.0 also features an SR Suntour suspension fork with 100mm of travel to absorb all the bumps in your way and a rear coil shock. Along with that, you’ll be getting ProMax front disc brake and rear alloy V-brake so, you can stop with confidence every time. What I really like about this bike are the thick knobbier mountain bike tires supported by alloy rims that supply enough traction for that extra stability on ever-changing surfaces. Though there are a few things to look for if you are considering to buy this dual suspension MTB. Firstly, it only features a front disc brake which is good for your normal routines and all, but if you take things to the extreme, then you might need to upgrade the rear V-brake. Apart from that, it comes from Schwinn! So, no trust issues for you. You might be living in a cave or something if you are not aware of the reliability and credibility Schwinn offers. If stability is a must for you, but your heart desires the looks and feels of a mountain bike, then look no further because Talus 2 is all that you need. It’s a perfect mountain bike for people looking for versatility and always offers you more. At home, dirt or gravel, or the pavements, this mountain bike will keep your adventure going. When you decide it’s time to head off the road and explore the path less traveled, this bike is right there for you. The bike comes equipped with a 6061 aluminum frame and a steel handlebar. The lighter weight frame provides a more upright and comfortable riding position than most of the mountain bikes, putting you in a better vantage point for spotting any obstacles in your path. When it comes to the shifters and gears, this bike comes in with three gears in the front and seven gears at the back with 7-speed Shimano Altus shifters. So you’ve got plenty of gears to choose from out on the trail. 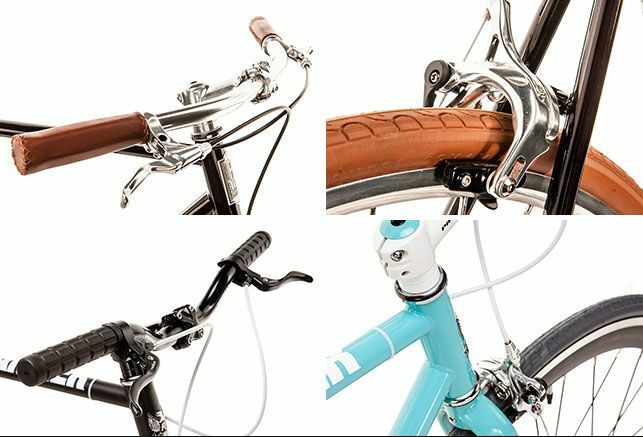 What’s good about these Shimano Altus trigger shifters is that they allow you to easily click through those 21 different gears without having to move your hands off the grips. Other than that, the bike features 27.5-inch wheels and 2-inch wide tires. These Kenda Slant Six tires really make a difference when comfort is your top priority and help you stay nimble but stable over the bumps. Apart from that, SR Suntour suspension fork and Raleigh Mountain plush saddle ensure that your ride is a comfy one no matter the distance. Along with that, the Alloy V brakes provide stopping power regardless of the conditions. The only thing that seems to be missing is the disc brakes, but again you can’t really complain about a bike that’s around $300. Insane right! 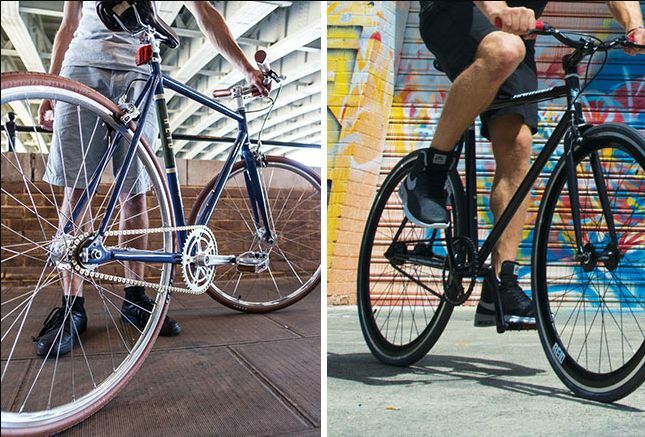 When shopping for bikes, what can you get for $300? We have to give all the credit to Raleigh; it’s absolutely a perfect entry-level mountain bike for anyone who is thinking of getting into mountain bikes. Gravity bikes have quite a lineup when it comes to high-quality bikes that are able to handle any type of trail riding, keeping that price tag under $500. 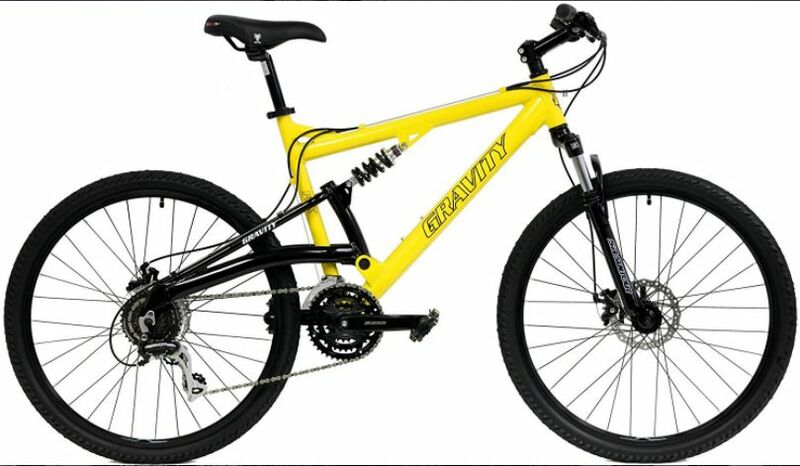 So when talking about entry-level mountain bikes, Gravity pops up in your mind! 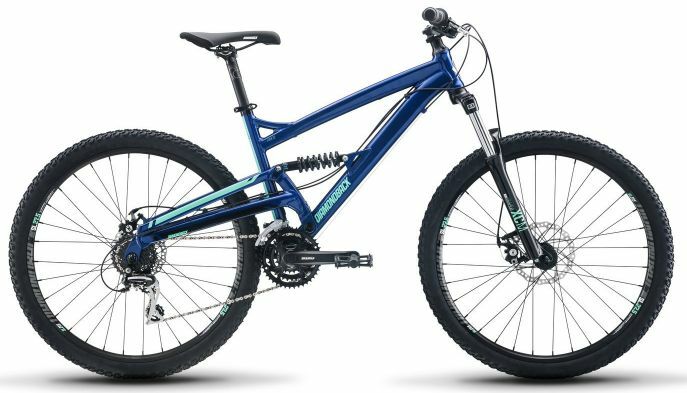 These bikes are good for beginners looking for full suspension mountain bikes for their downhill endeavors and for just the thrill of riding a dual suspension mountain bike. From aluminum frames to adjustable suspensions, they feature everything that a high-end mountain bike offers at a much greater price than this one. Taking this fact into consideration that the full suspension bikes aren’t that cheap, Gravity has really put on a bike for us that’s not gonna put too much load on the wallet and also offers solid build quality when it comes to the components. The bike comes in with an aluminum alloy frame which is lightweight and delivers higher performance thanks to hydroformed tubing. The frame is surprisingly lightweight with all that added frame reinforcement and dual suspensions; the bike weighs just around 26 lbs. The front suspension has quite some of travel to soak all of the bumps, and for downhill riding, the bike features rear coil shock. Though I wouldn’t recommend it for extreme Downhill Mountain biking, it’s good for cross country and single track mountain biking trails. Also what’s good about these shocks is that they are all adjustable, so you can adjust them according to the terrain you are riding on. For additional comfort, the bike also features a comfortable saddle with an aluminum alloy seat post. As for the drivetrain and braking is concerned; the bike comes in with Shimano EF51 24-speed shifters that offer ultra-light and precise shifting. Alongside that, you get a wide range of gears to choose from. Three up front and eight gears in the back which is ideal for any kind of steep climbs or cruising at top speeds. For maximum stopping power, the bike features Tektro Novela mechanical disc brakes. When it comes to the cons section; there are a few things to note down, when you look up close. Overall I’m not saying that it’s a not a good bike, but there is some room for improvement. First one, due to less tread on the tires, the tires lack traction. So, if you are looking to upgrade your bikes trail performance, you need to upgrade them rather sooner than later. The other thing to note is that you have to adjust the rear suspension after you have ridden the bike a few times, also don’t expect the suspension to be too good in terms of travel amount. Apart from that, overall the bike is really impressive and delivers exactly what it says on the paper and performs way above its pay grade. So if you are on a tight budget, then it’s a good bargain for the price. So why there’s a need for another Gravity model when it comes equipped with almost the same components that the Gravity FSX 1.0 offers. It’s because with the FSX 2.0 Gravity checks all the boxes by making necessary changes to the departments that needed some improvements. So with FSX 2.0, you are getting new and improved shocks with a different kind of rear shock placement, which offers greater shock absorption than the FSX 1.0. They have improved a bit when it comes to the tires section and isn’t all that bad, but note they don’t offer you the same amount of tread or traction that you need for extreme trail riding. Apart from that they are quite durable and offer a good amount of durability against flats in most of the scenarios. This particular model would cost you around $400. When we are talking about dual suspension mountain bikes, apart from the looks, the price tag is the most attractive thing about the bike. So if you are looking for a nice sleek entry-level mountain bike with dual suspensions, then this is the way to go. The other bike from Schwinn that I really love is the Schwinn High Timber. It’s a good beginner’s mountain bike and most of the times would be good for any type of rough tracks or trails unless or until you stay away from extreme downhill riding. High Timber is made from steel, so it’s really a resilient and sturdy kinda bike for exploring hidden trails and most importantly you are not spending that much. It is listed for around $300, which means you won’t have to break your bank to buy this MTB. 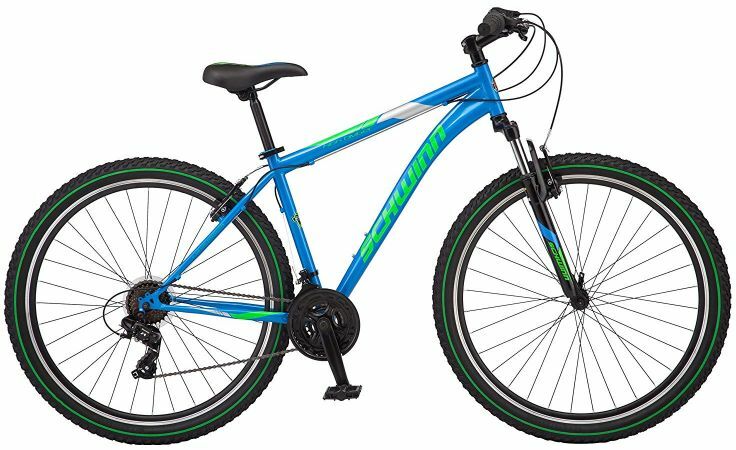 Some of the key features of Schwinn High Timber are a mountain-style steel frame with front suspension to give you a durable and responsive riding experience. Along with that, you’ll be getting Shimano 21-speed drivetrain with three gears up front and seven at the back with Shimano Twist shifter and rear derailleur. It’s surprisingly quite smooth and precise for a bike this cheap. On the downside, there are a few things to note down with this bike. The bike comes in with alloy linear pull brakes which means you won’t have that kind of leverage and precision of disc brakes when you are on the trails. The other thing to note is that it’s a steel frame though it would be by far more comfortable than an aluminum frame, but it’s a lot more heavier and would be difficult to ride uphill. Apart from that, it’s a perfect mountain bike for any kind of flat rough trails with those knobbier tires. You’ll get the traction that you need. So if you are just getting into mountain biking and can’t stretch that budget out a bit, then this is the bike I would recommend you because you can always upgrade the components along the way. 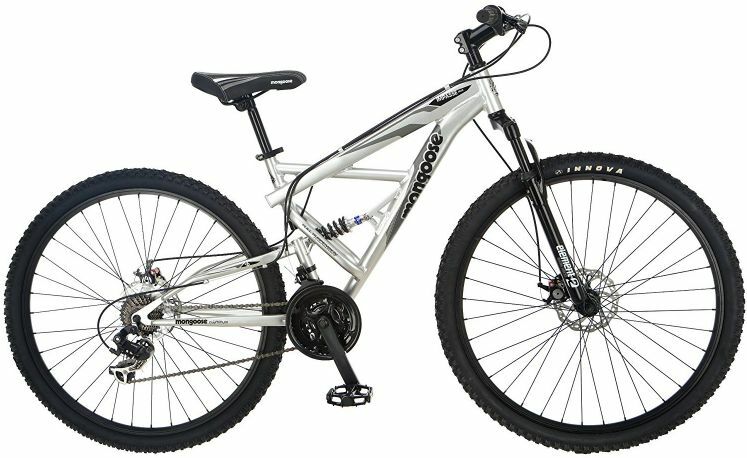 Mongoose R2780 Impasse is the best Dual suspension bike that you can get for around $250. It’s almost like $100-$200 cheaper than the Schwinn’s Protocol and Gravity FSX models. But don’t consider it to be better than the two I’ve reviewed earlier. It’s because at the end of the day you get what you pay for. Though it’s a lovely full suspension bike and most importantly the cheapest MTB with dual suspensions or I would rather say most affordable. Coming to the features, the bike comes in with a lightweight and sturdy aluminum frame which is meant to take on trails by storm with those 29-inch wheels. Along that to give you that typical mountain bike shock absorption you’ll be getting Element suspension fork and a rear coil sock. Moreover, you’ve got 21 different gears to choose from, and with those 29er you can really fly. The other thing to like about this bike is that being this cheap; it features mechanical disc brakes which I think are essential for a MTB. If you are considering taking Impasse to extreme trails, then you might consider upgrading the rims as they are a bit cheap. So you have to upgrade them rather sooner than later. Though many people were more than satisfied with the rims, but there are a few complaints. So note it down! Apart from that it’s an absolute beast and would deliver much more than its pay grade. So I’ll recommend you to shortlist it. Read some customer reviews from Amazon and then decide if this is perfect for you or not. If not then I’ll highly recommend you to stretch your budget out a bit and go for a mountain bike that is above $300 mark. BRAKES 26" x 1.95" 27.5″ x 2.1″ 27.5″ x 2.1″ 26" x 2.1" 26" x 2.1" All Sizes 29" x 1.95"
Many of the women do get along very well with unisex or men’s mountain bikes. But like most of the women, if you also prefer a women’s specific MTB that is built with a few strategic tweaks in their design and geometry to make it more comfortable and a better match for a woman’s body. These are the five best entry-level mountain bikes for women’s. The Lux may be an entry-level mountain bike for women, but it doesn’t perform like one. It is sturdy and responsive and offers quick shifting and braking. Overall you would definitely feel it is noticeably smooth when it comes to maneuverability which makes it great for those looking to hit the trails. 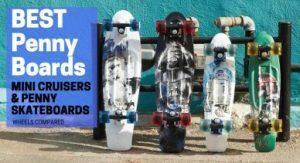 It comes in with a 15-inch 6061-T6 aluminum alloy frame which is quite lightweight and durable and being built for women there’s also some added standover clearance. It’s just perfect for anyone looking for an entry-level hardtail women’s MTB. What I really love about this bike is its sleek and aggressive feel, like its ready to take on anything. But don’t get confused because it might not! It comes with SR Suntour suspension fork which gives you 80mm travel to damp all those bumps and drops, but it is meant for light singletrack trail riding or for casual cross country trails. But as a beginner MTB, its pretty great. Apart from that, you’ll be getting Shimano 3×8-speed drivetrain which means you’ll be getting 24 different gears to choose from when taking on those steep climbs. You also have Shimano Easy Fire EF-51 Shifters, Shimano Tourney front derailleur, and Altus rear derailleur. So overall it offers quick and precise shifting when you need the most. For the last part, what I really love about this bike is that it features Tektro Aries mechanical disc brakes with thicker knobbier 27.5-inch Chaoyang Hornet tires. This is where all the traction comes from which you need on ever-changing surfaces. For the bottom line, it’s one of the best entry-level MTB on the market for women. The value that this MTB bike offers is through the roof; you would love it over the years to come. There’s also another hardtail MTB for women that I have reviewed. Its form Royce Union so do check that out too before going for the Diamondback Bicycles Lux. If I can find the right words to describe Mongoose MTBs, I would say these mountain bikes deliver much more than their pay grade and don’t break the bank along the way. Buying an affordable entry-level MTB with dual suspensions doesn’t have to mean that you have to sacrifice on the quality. But many manufacturers do that except for Mongoose. Though these bikes are not the most advanced or the best full suspension mountain bikes for women but when you are talking about entry level MTB bikes, it’s the best that you can get for around $200. If you are looking for an entry level bike to grow in the sport than Status 2.2 is the bike to look for. It’s a bike which can offer you a handful amount of features for a price that is almost a quarter of what some other companies are charging. It features a lightweight aluminum frame with Hydroformed tubing which is paired with front and rear suspensions. Altogether this configuration gives the Status 2.2 one of the most plush rides that you can find for this price. As far as the shifting and gears are concerned, it’s a 21-speed Shimano drivetrain with SRAM twist shifters. So there’s a wide range of gears to choose from for climbs, descents and achieving that top speed without bursting your lungs. But being cheap it means that you have to compromise a little because personally, I for sure won’t like twist shifters on my bike. So if you ever feel like getting this one, it would perform a lot more better with the Shimano trigger shifters which offer a more quick and precise shifting. Apart from that, it comes with 26-inch thicker knobbier tires which offer you good traction over the ever-changing surfaces and for stopping, power alloy rim brakes do all the work. If you are out looking specifically for a full suspension women’s MTB, then this is the one to look for. With solid performance out there on the trails and for just around $200 it’s a win-win. Before making any decision, do check out the other model from Mongoose. 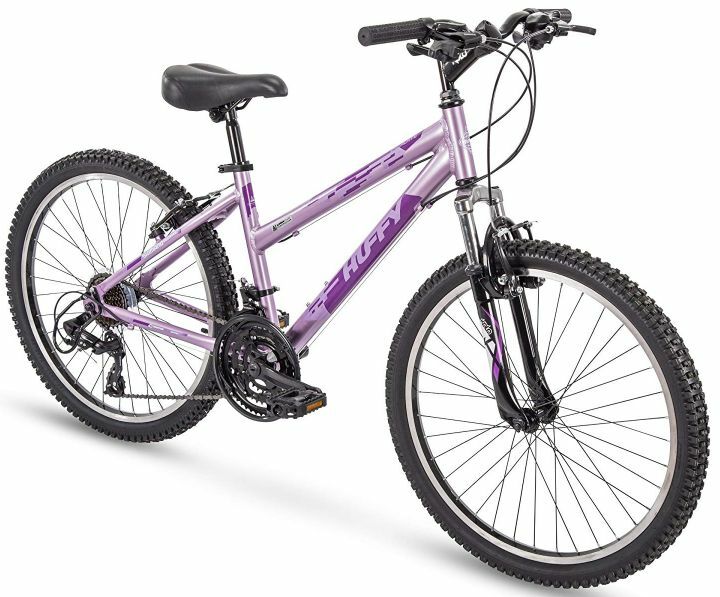 Most of the things with Mongoose R3577 are pretty much the same apart from the fact that it’s meant for girls and comes in with smaller 24-inch tires than the 26-inch tires. The other thing that sets it apart from Status 2.2 is that it’s surprisingly almost $50 cheaper. INSANE! Apart from that, it’s also featured on Amazon’s Choice where Amazon only recommends high rated products with a lot of positive reviews and that is also one of the reasons what made me feature this bike in Wheels Compared Ultimate Entry-Level MTB’s Guide. 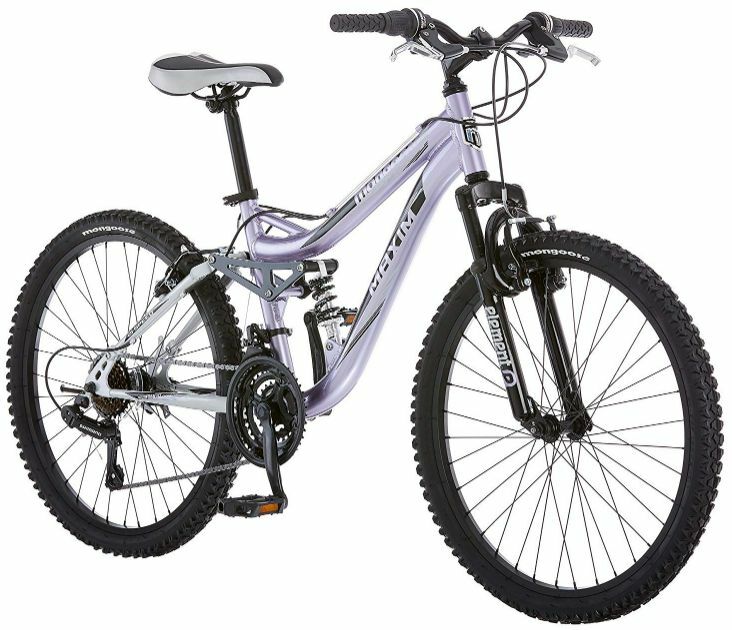 Women’s-specific MTB Aluminum frame with Hydroformed tubing and extra reinforcing on stress points. Yes, its dirt cheap and you can’t really complain about both the Mongoose Status 2.2 and the R3577 but if you might have noticed there aren’t any disc brakes. Though alloy linear pull brakes serve the purpose exceptionally but still I would highly recommend you to upgrade them to disc brakes which provide you greater leverage and better control out there on the trails. Apart from that, both the bikes are absolutely perfect in every single way if your approach is realistic. You just can’t get a better full suspension women’s MTB bike than this one with the price under $200. The fourth bike under the entry-level women’s mountain bike section is a hardtail cross country mountain bike with a step-through aluminum frame to comfort women. It is made by Royce and is one of the latest mountain bikes that came earlier this year that’s why you haven’t heard about it up till now. Royce Union’s RMA is perfect for casual cross country and singletrack trail riding as it comes equipped with front ZOOM suspension fork which smoothly absorbs shocks from all the bumps and dips in your way. As far as the drivetrain is concerned it is equipped with 21 gears; three up front and seven in the back with Shimano EZ Fire plus trigger shifters and Shimano Altus rear derailleur. All of this combines to give you ultra-smooth and precise shifting. Apart from that RMA is equipped with 27.5-inch wheels with thick and knobby tires that make it perfect for any kind of terrain. Being an entry level bike, the tires are surprisingly of high quality, which are grippy and provide great traction. You can get Royce Union RMA for around $300, and it is quite rare to get that kind of quality for such a reasonable price. Though this bike comes in with alloy rim brakes but overall it’s one of the best hardtail mountain bikes that you can get for around $300. If you wanna go with the disc brakes you have two options; either upgrade them or go for the Diamondback Bicycles Lux which I consider is a better option. Huffy Escalate is a lot cheaper option to have and is more affordable than the two hardtail MTB’s that I have reviewed earlier. You can get this for around $200 which is as good as it sounds! Both the Royce Union RMA and Huffy Escalate are pretty much same in every way, but there’s a huge difference of almost $100 between their price tag. That’s because of the difference in the suspension fork and wheel size. RMA uses a Zoom suspension fork which is a lot more better than the KOLO 2200 suspension fork and gives you a bit more travel to absorb shocks from all those bumps and dips that you’ll find on the trails. Apart from that, the wheel size totally depends upon your personal preference; whether you wanna go with the 26” x 1.95” or the bigger and wider 27.5” x 2.1” wheels. Totally comes down to you! Other than that all the features are same on both the bikes. Same 21-speed Shimano drivetrain with Shimano EZ Fire trigger shifters, alloy linear pull brakes, and same step-through MTB frame geometry. So overall both are quite similar. If you ask me which one is better RMA or Escalate, then I think Huffy Escalate wins because it offers almost the same amount of value and features that the Royce brings with RMA, but it is a lot more cheaper. So at the end of the day, it comes down to you, whether you wanna pay more or just wanna go for the cheaper Huffy Escalate which offers the same kind of value and you are paying almost $100 less. When buying a new mountain bike, there are a lot of things to consider these days. It’s no longer front suspension vs full suspension, and there’s 27.5-inch wheels, 29-inch wheels, plus bikes, fat bikes all these new worlds of mountain biking that didn’t even exist a few years ago. It can be a bit bewildering, and if you’re looking to buy your first mountain bike or looking to upgrade after a few years, there’s a lot of things you need to consider. So without any due let’s clear some things up and help you decide the best mountain bike that would be best for you. One of the first questions many riders ask themselves is do I need a hardtail or full suspension MTB. If you are not familiar with the terms, a hardtail is a mountain bike that only has suspension at the front. On the other side full suspension is exactly what it sounds like you’ve got a suspension at the front and rear of the bike. If you are on a budget a hardtail can be a good choice because they tend to be a lot lighter, less maintenance and you get more for your money. 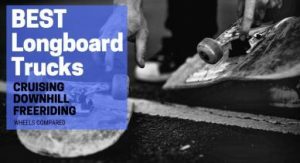 They can also teach first-time riders or beginner riders a lot of basic mountain biking skills such as line choice and body movement around the bike. On the flip side modern full suspension bikes are incredibly capable and a whole lot of fun — one thing to keep in mind though they do tend to be more expensive. So how do you decide? Choosing between a hardtail and full suspension ultimately comes all down to how and where you’ll be riding? When deciding between a hardtail and a full suspension ask yourself where you are going to be riding. If you’ll be riding mostly on rolling trails, smooth trails or cross country trails, then hardtail could be a really good choice for you. On the other hand, if you are going to be tackling rockier terrains or you like to go downhill, a full suspension might be the way to go. There’s also one last thing to consider when choosing between the two. In general, a full suspension bike will be heavier than a hardtail because of the addition of rear shock and extra frame material that adds to the weight of the bike. Why does that matter? A lighter bike will be much easier to ride while going uphill and over long distances. So if weight is the deciding factor for you, then choose a hardtail. But if you prefer an all-around more capable and more comfortable ride, then choose the slightly heavier full suspension bike. If you were to walk in a bike shop 15 years ago, you would probably only had to choose between two tire sizes for your mountain bike, and that was pretty easy. Five years ago it was between 26-inch and 29-inch wheels. A few years ago 27.5-inch wheels more or less replaced 26-inch wheels, but it didn’t get easier. So now, we have 27.5-inch inch wheels, 29-inch wheels but we still have 26-inch wheels with fat bike tires that are about 4 to 5 inches wide. 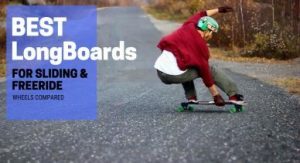 It’s a lot to wade through, and you can narrow it down by figuring out where you’re going to ride and what type of rider you are. 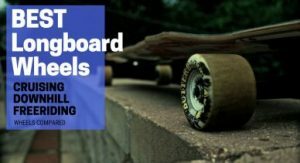 So when it comes to 27.5 VS 29 inches wheels, there are a couple of things to consider. Number one again where will you be riding, do you like fast flowy trails where 29ers will be faster and suitable to take. If you like technical terrain and like to throw your bike around, then 27.5 can feel a bit more agile. But it’s not cut and dry, for example, if you are a shorter rider you might be more comfortable on a bike with 27.5 inches wheel or if you are taller you might prefer 29er. Again it can come down to how you ride if you would like to plow through rocky terrain 29er is greater for that if you have like maybe a BMX background and like to boost off everything on the trail 27.5 might be the way to go for you. All entry-level mountain bikes will be constructed from aluminum. Aluminum is a very versatile frame material, easy to work with and modern aluminum bike frames ride pretty well. As you get into mid-level mountain bikes, you’ll see a mix of carbon and aluminum, sometimes from the same manufacturer. In such cases, you usually see a carbon bike with lower end components, right next to an alloy bike with higher end components, so you need to decide according to your preference. So, you gotta ask yourself; am I looking for a nice carbon frame and upgrade the components as I wear them out or do I want to buy one nice alloy bike and just be done with it. So the choice is up to you! Most of the mid-range entry level mountain bikes offer disc brakes, which are both hard wearing, responsive and extremely effective at bringing you to a complete stop smoothly and safely. On the flip side, V-brakes are perfectly suited for lighter off-road riding and are often found on budget mountain bikes. They are strong and responsive, but the difference in the performance becomes obvious as you step up the range to mechanical disc brakes and hydraulic disc brakes. Disc brakes are heavier and more expensive than v-brakes but offer more stopping power and work even better in difficult weather conditions. Hydraulic disc brakes are often considered as an upgrade to mechanic disc brakes due to their rapid response and smooth, accurate performance in any condition. Last but not least, when choosing a mountain bike you have to ask yourself how much you are willing to spend. It’s good to have a specific budget in your mind and stick to it because there’s so much out there that you might wanna grab everything. I’ve structured this buyer’s guide for people with different sets of budgets. So it’s really easy to choose from, or if you have any other bike that you like or have shortlisted earlier, now you know what to look for when buying an entry-level MTB. As for my final advice don’t be put off by all the different technologies out there; frame materials, wheel sizes all the different components. Instead, think of it as this is your opportunity to find a bike that’s not a cookie cutter product, it’s your opportunity to find a bike that’s tailored for you and how you ride. With that said it’s a wrap. Hope you all enjoyed this detailed guide of how to buy the best entry level mountain bike. Feel free to hit me up in the comments section and if you’ve got any kind of query or suggestion I’m open for discussion. Also, do let me know which mountain bike you chose in the comments.